Its almost the forth of July so I have my patriotic stamps and stars of course out on the stamp table so a Penny Black red white and blue theme challenge seems about right. 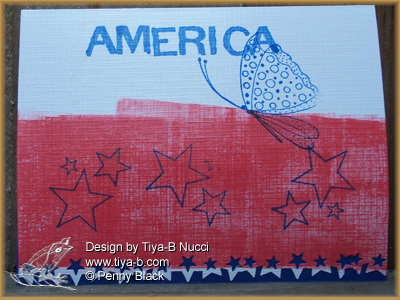 I bayered a red stripe on g-rated glossy linen, added stars (Stampin up) and the Penny black butterfly, America from print works print works and the star punches at the bottom Martha Stewart. Looks kind of patriotic. I almost forgot i glued blue strip under the punching so the start on the bottom would be visible. 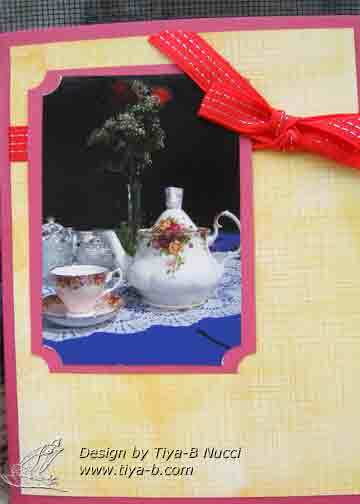 This card also is entered in the Happily ever crafter challenge. enter if you have a red white and blue entry! 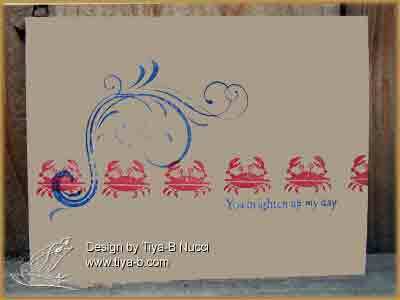 The challenge for simplicity one layer Wednesday 7 was repitition to use one the little stamps in a collection by repeating so I garbed the crab and repeated him across the beach. added a papertreyink clear wave and a hero arts clear stamp sentiment. 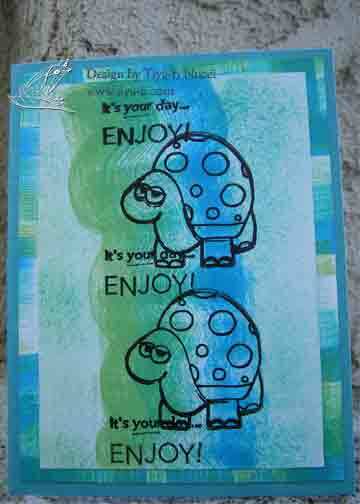 The Stampin’ Royalty challenge was to keep it simple sweetie and I just cased a simple card at Simplicity and wanted to include a punched frog. 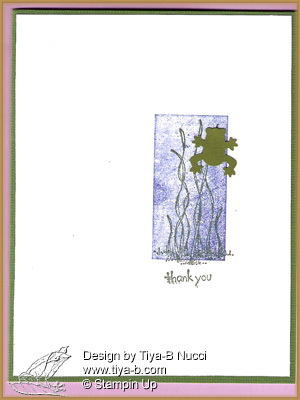 The card is stamped with a blue ‘Stamp in the Hand’ shadow rectangle, then green G-rated grass t and finally a ‘thankyou’ from Stampin up. KISS a frog has a new meaning here. 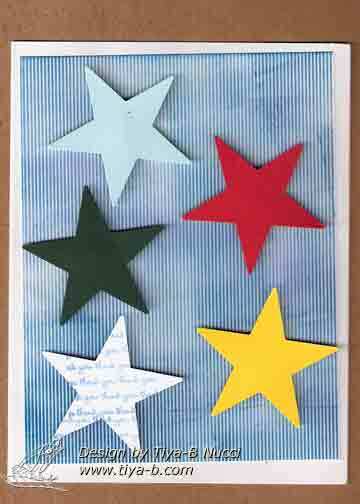 Another star thanks, the paper isw G rated glossy striped which i bayered with blue ink, the stars are punched. the white star has little thanks on it. Thought I’d put up one more tea card before I start publishing my ‘unfinished -as -yet Christmas cards. The background paper is that pretty g rated linen. still cannt decide which watermark to use…. here are two of them. 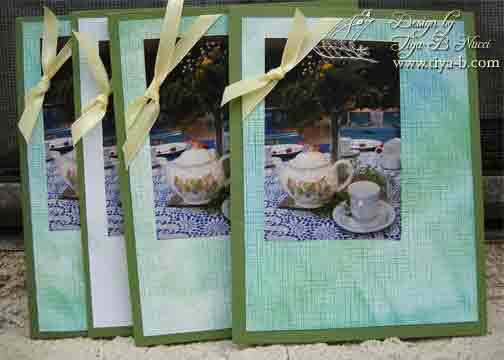 I made several tea cards for sale at our annual boutique. 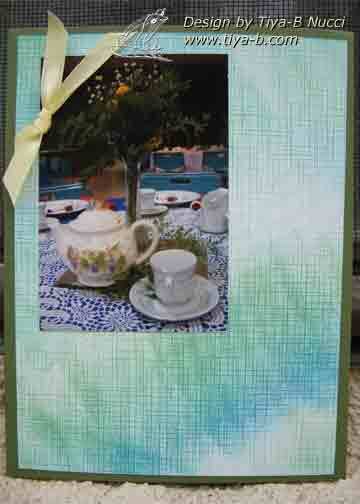 Here’s #2. pictures of tea sets, flowers and bows.